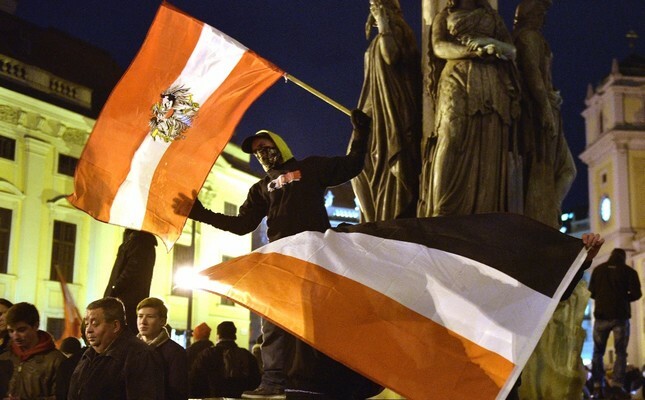 Far-right groups wave flags and display banners during a rally against Islam in Vienna, Austria, Feb. 2, 2015. The current Austrian government has been in place for nearly one year now, and it has made good on most of the claims it had presented in the coalition's program for government. In a super rapid way, the coalition, which was formed by the Christian-democratic conservative Austrian People's Party (ÖVP) and the radical right Freedom Party of Austria (FPO), implemented one piece of legislation after the other to combat what it calls "political Islam." While the term political Islam has generally not been used in the past by the Austrian authorities, such as the Federal Office for the Protection of the Constitution and Counterterrorism, which uses the term Islamism, the government has deliberately introduced this term in its coalition program to threaten not extremist and violent threats, but common Muslims, representing the weakest part of Austrian society. While the Austrian government is currently threatening various NGOs, from environmental organizations to other human rights organizations, in particular, it has implemented hard measures against this politically and economically weak group of Muslims. It seems they are functioning as the playground for more and more authoritarian policies. First, the government presented its plans for a hijab ban in kindergarten. Then, the government made international headlines after announcing, in a theater-like press conference, that it would shut down seven mosques as a measure against political Islam. Fortunately, a few weeks later, lawyers appealed to the Viennese Administration Court, which immediately lifted the closure of the mosques. After the parliamentary summer recess, the government pursued further legislative endeavors. In one, the ban on the hijab was finally implemented by issuing a contract between the federal government and the nine states of Austria. While Jewish skullcaps were permitted, only the Muslim hijab was targeted. The proposal explicitly states: "Wearing of the hijab by kids in elementary educational institutions can lead to early sexual segregation, which is not compatible with basic Austrian values and social norms. Orienting oneself according to religious values shall not be in contradiction with civic education, which has to secure the equality of men and women." Clearly, the government clothed its ban in a perspective of defending Muslim girls by framing Islam to be "fascistic;" thus, the Muslim woman has to be freed from the coercion of this system of belief. This was also the framing for another act that was just adapted in parliament. The vice-chancellor argued that banning the symbols of "fascistic Islam" would end the "creeping Islamization" that the far-right in Europe refers to. The government thus proposed and implemented a ban of symbols that potentially threaten Muslim civil society. This was done by banning the symbols of the Grey Wolves, connected to the Nationalist Movement Party (MHP), and the Muslim Brotherhood and all groups that are part or successor organizations to the aforementioned. This expansion of the definition and inclusion of other organizations is defined by decrees issued by the interior minister. Last, the government just made its threat true that the first measures were just the beginning. As the vice chancellor and leader of the right-wing extreme Freedom Party had already declared, the ban on the hijab in kindergarten would only be the beginning and should finally be expanded to schools, universities and public offices, declaring that Turkey before the rule of the Justice and Development Party (AK Party) should work as a leading example. Hence, the government just implemented another ban on the hijab pupils up to the age of 10 for elementary school. And this ban is just the second legal step to possibly expand such a ban to other fields, as the Freedom Party leader had already argued. All of these measures reveal how the current government is strengthening the state vis-à-vis its individuals by defining the clothes of vulnerable minorities and by regulating the symbols of groups – from nationalist to extremist – that are again part of more vulnerable ethnic minorities, while at the same time not touching white nationalist organizations. Allowing the government to implement these measures will open the door for more and more regulations in the long term. This is what other minorities and the opposition have to understand, and build alliances to counter these authoritarian tendencies. * Political scientist in the Department of Political Science at Salzburg University and Senior Research Scholar at Georgetown University's The Bridge Initiative in Washington D.C.